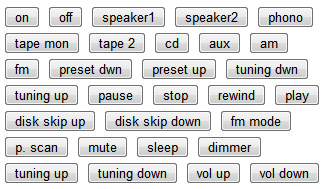 Here's how you can control your stereo over the web. Not only that, but any other electronics with a IR remote control can now be controlled through your browser. You can even use your smart phone's browser to control your stereo from across the room or around the world. This project has several pieces: a simple Python web server running on your computer, an Arduino with my infrared library, and an IR LED or other emitter. The Python web server provides a web page with a graphical remote control. Clicking on the web page sends a code to the web server, which sends it over the serial port to the Arduino, which sends it to the IR LED, which controls your device. I used a rather trivial Python web server (based on SimpleHTTPServer) that performs two tasks. First, it provides the static HTML pages and images. 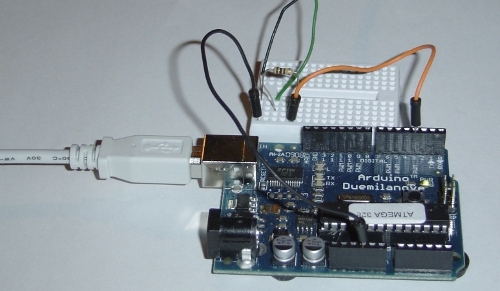 Second, it receives the POST requests and sends them to the Arduino using the pyserial library. The following code excerpt shows the handler that processes POSTs to /arduino by extracting the code value out of the POST data and sending it to the Arduino over the serial line. The Python server automatically provides static pages out of the current directory by default; this is how the HTML files and images are served. The code assumes the serial port is /dev/ttyUSB0, which is typically the case on Linux. The server can be accessed locally at http://localhost:8080. You may need to mess around with your firewall and router to access it externally; this is left as an exercise for the reader. I found that using my cell phone's browser via Wi-Fi worked surprisingly well, and over the cellular network there was just a slight lag (maybe 1/3 second). In more detail, the Arduino waits for 9 characters to be available on the serial port. It then parses the hex value and calls the appropriate IR library send routine. The Arduino code does some special-case stuff for the different code types. Sony codes are transmitted three times as the protocol requires. The RC5 and RC6 protocol uses a toggle bit that is flipped on each transmission. (Disclaimer: I don't have RC5/RC6 devices, so this code is untested.) If your device uses a different protocol that the library doesn't support, you're out of luck unless you add the protocol to the library. That's probably not too hard; a couple people have already implemented new protocols. Most of the smarts of the system are in the web page. In my setup, I have a HK-3370 stereo, and a Sony CDP-CE335 CD player. 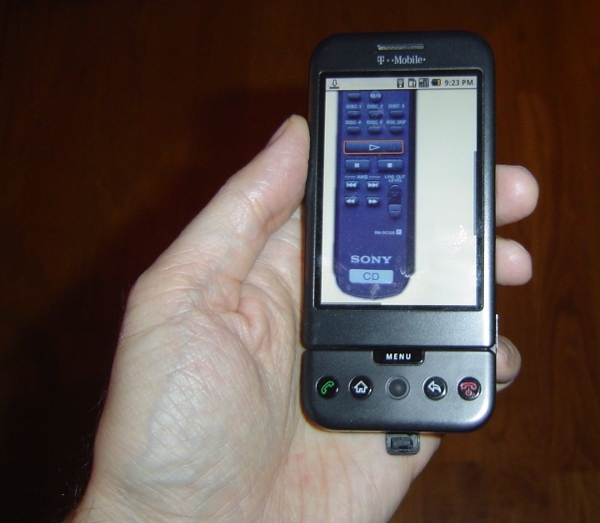 I took a picture of the remote for each and used an HTML image map to make each button clickable. Clicking on a button uses Ajax to POST the appropriate IR code to the server. Each line in the map defines a region of the image as a button with a particular code. When clicked, this region will call the button function with the appropriate code, causing the code to be sent to the web server, the Arduino, and finally to the stereo. The alt text isn't actually used, but I recommend it to keep track of what button is associated with each line. The href causes the cursor to change when you go over the region, but isn't necessary. In this approach, the Arduino code and web server code are very simple, as they don't need to know the functions of the codes. A different way to implement this system would be to put the table of codes ("SONY_CD_ON" = 4d1, etc.) either in the web server code or the Arduino code. The easiest way to obtain the IR codes is to use the IRrecvDump example sketch included in my IR library. Simply press the button on your remote, see what code was sent, and put that code into the image map. Alternatively, you may be able to find codes in the LIRC database. Once you get going, it's actually fairly quick to generate the image map. Select a button in the editor, click the physical button on the remote, copy the displayed value into the editor, and move on to the next button. As long as you don't get obsessive and start tweaking the regions to line up perfectly, it's pretty quick. The Arduino does the work of converting the hex code into an IR signal. The IR library uses digital PWM pin 3 as output, which must be connected to your IR emitter. I use a 100 ohm resistor to limit current. Wiring it up is trivial. I used a Tivo IR blaster that I had lying around, but a plain IR LED will work too. The following picture shows an IR blaster attached to my sterero. Note that the blaster needs to be positioned about the stereo's IR receiver; it may be easier to see the receiver with a flashlight. Download the files and unpack them. Get the infrared library and install it. Connect the Arduino to the computer's USB port. Compile and install IRwebremote.pde using the Arduino IDE. Go to http://localhost:8080 and control the devices. This project has multiple pieces and requires customization, so it's not a plug-and-play project. I only recommend trying this if you know what you're doing. Good luck! This really a neat project. I've gotten it to control the mini and my Samsung TV (the latter I had to change 9000 to 4500). Playing around with RC5 which it receives but have not gotten it to control the device (yet). Thanks much. Great idea for a project. that will be helpful not only me I guess. This project is great! just similar to what I want to do. I am planning to do a universal IR remoter with Arduino. It should be combined with two parts; first one is for recording varies IR remoter via Arduino, and then store the code by PC program; the second part is to replay the code via PC program, and then transmit via Arduino. My goal is the system should be able to adapt for NEC, SONY, Philips...IR protocol, and able to control many kinds of appliances. Is someone also interested on that? i wanted to use an actual remote to control the computer, make it swich on,switch off or use it to control the windows media player. Could u please tell me how to go about it.the only place in lirc for linux which makes this possible. can i use windows 7 and try this? I'm having problems sending codes for changing the TV channel. How to change the code for sending the command, for example, go to channel 31? How to make with one click button to send 2,3,4 or more different IR codes to board ?? it is possible to send RAW data from web ? if its how ? Hi. I'm trying to do the same but I was thinking to change the ir transmitter with an optocoupler and wire it in the device board. Any of you have experience of doing this way? Whats the maximum optocouplers an output accepts? This is a major leap ahead for me. Thanks! Your work has really helped me progress with my own project, I am interested in using this sketch to control my Xbox 360. How would I go about implementing the unsigned long long into this sketch?. Great work Ken, thanks a lot. For some reason, the application is very slow in my chromebook running Ubuntu, so I ported your idea and parts of your code to apache/php, the result is fantastic, it runs a lot faster even in my small chromebook. Now my wife can watch the tv in the ironing room, controlling the cable box located in my bedroom (in the opposite side of the house) using her iphone. does your library need an Ethernet shield for arduino or does it need the computer connected to arduino to be operated "ON" since i get the internet from the computer, or something else? sorry, i meant to say "does the infrared web based code need"...instead of "library"
I used a raspberry pi instead of an ethernet shield, it can run the python web server ken has above plus power & communicate with the arduino over USB... Feel free to ask any questions, I'll do my best to answer them. Hi, I am having a lot of fun with the IRremote library! thanks. But now I am stuck trying to send code to a Yamaha HTR-5550 receiver. I bought it without the remote (RAV-242). Without the remote I can't turn of the "Set Menu" options. I found the service manual from hifi-engine and the manual has hex codes for the remote. i.e. Power: Custom Code (hex) 7A and Data 1F. I tried all the send methods :) such as SendNEC(0x7a1f, 32). I have ran out of combinations to try. Please help! For "Set Menu" Custom Code (Hex) 7A and Data 9C. If buying a replacement remote isn't an option for you them I suggest you use the link below, there you will find a list of remote codes for Yamaha devices. I don't want to buy a $39 to $49 remote to just getting into some menu setting. Plus, I have the service manual with the code. I thought I can build my own remote with arduino. 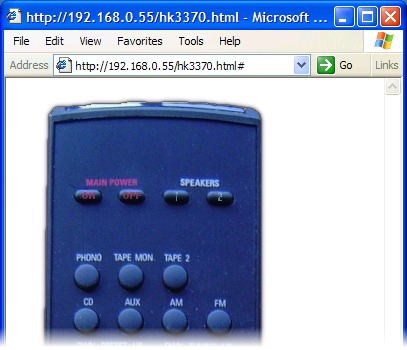 http://lirc.sourceforge.net/remotes/yamaha/RAV243 is the closest one matches the remote code for HTR-5550. Notice it has Pre-data 0xF7 and POWER on is 0x0000000000000002 (that is like 0x02) so the number of bit is similar to mine. * An IR LED must be connected to Arduino PWM pin 3. Calling Houston, we have established communication with receiver toggling on/off with 0x5EA1F807 NEC. This stupid receiver's menu for setting speakers is only in the remote! Perhaps that was the reason for the $10 receiver price haha. Service manual spec for Power is 7A-1F. Im not sure why I'm finding this so hard but I can't seem to capture and replay any codes. Maybe someone can add this to the library. First of all thanks Ken for this great post! Your library works very good and thanks for the examples. However I have a small problem with my Aiwa stereo, I receive the IR codes form the remote but when I send them trough Arduino the stereo doesn't recognize them. Neither code is accepted from the stereo. Is it possible that the Aiwa stereo can't accept this codes because it uses different IR receiver form that I'm using on my Arduino? And can someone adjust the arduino code to accept raw codes? Hi Anonymous, Can you post your Arduino code? Martin I'm using Ken's original Arduino code. It would be very useful if someone could adapt this Arduino code to accept raw IR codes. What Arduino are you using? I tried your code, but no luck. I think the problem is that the Arduino, for some reason, don't receives the wright code and that's why my stereo doesn't understands the codes. I can send codes from 3 other remotes but not this Aiwa remote. Du you think that is possible to send this lirc codes? Is it a cd player/stereo or a receiver? It is cd player/stereo, this codes worked from my Nokia E51 mobile phone. this is my project, only the first remote doesn't work. Refering to Anon's isseu using AIWA-Remotecodes. I also tried to decode Aiwa and was happy to find out that the lib showed NEC-Codes coming from the Aiwa-remote but in fact they are not! You can identify a real NEC-Code by checking every other byte of the received code e.g. NEC:1D-E2-10-EF where E2 is inverted 1D and EF is inverted 10. If you check the Aiwa-Codes you'll find out that those codes are not following this rule. That's why sending out NEC-Codes to Aiwa will not work.